It is interesting how life seems to arrange itself into seasons. And like the seasons of each year, the seasons of our lives seem to have defining characteristics and eventually move on to a new and different season. After my religion period, I took up with a swindler: Allardyce Merriwhether. After Mrs. Pendrake his honesty was downright refreshing. we move from through our lives in stages, each defined a little differently. For the first two years here in Savannah I rarely had to work on a Sunday. In fact I was usually wanting a little more weekend work because I get paid a little extra for it. The past few months our weekend work has picked up considerably. As a measure I’ve only been able to attend 2-Â½ church services in the past 8 weeks. I know some folks would say that is still too much church. But I think many of them would find that the church I go to is a little different than the image they have in their minds of what church is. And besides, I like being there. I even led the tech team for a while. These days I seem to be working a lot on Sundays. I’m OK with that. My life priorities put my job ahead of church attendance. Fortunately yesterday was one of the 2-Â½ that I could be there. It was good. The tech team had one of their best days in a long time (they’ve been plagued with tripping circuit breakers and such). The band was rocking, but played songs some of us (slightly) older folks could sing along with. The message was spot on (as always). I felt connected with God. All in all it was a good day. I’m looking forward to the end of this season of weekend work just like I’m looking forward to the end of our long hot summer. There are days when I don’t get excited about my job. And I have a really good job in my industry. It is considered by many to be a career capper, and most guys stay with our company until they retire once they get in. Today is one of the days that doesn’t excite me. I have to be out at a ship at 0630, which normally wouldn’t be all that big a deal. It’s not like I’m going to have to do all that much physical labor when I get there. Just take some pictures and jot down some notes so I can go back to the office and write a report about it. Actually it is kind of nice to be in a stage of life where I am getting paid more for expertise than for my physical work. Mostly because I have a lazy streak, I guess. Well it probably wouldn’t be so bad except Gorgeous and I have planned a Friday night out tonight. We hope to see the new Pirates of the Caribbean movie. Normally I don’t go to movies on opening night but Gorgeous is going out of town on Monday for a conference and won’t be back until after I leave town for work. So we have a bit of an extended time apart which is enough to prompt us to attempt to fight the crowds tonight. But I’ll probably be a might sleepy because of the early start. Did you ever wonder why work can be such a drag sometimes no matter what you do? Would you believe there is an explanation for it in the Bible? It goes all the way back to the beginning. Back to the garden of Eden. When God found out that Adam & Eve had done the one thing that He told them not to do, He threw them out of the place. â€“ Talk about violating the terms of your lease! Sheesh! They only had 1 rule to follow and they couldn’t do it. No wonder we humans are so messed up! Yep. Basically God said there will be days when you won’t get excited about your job. Lots of them. I know that doesn’t really help make it any better â€“ no useful job enjoyment tip today. Sorry to disappoint you. But sometimes doesn’t just knowing why something is the way it is make it a little less frustrating? Last night it rained here in Savannah. It was pretty heavy at times with lightning crashing all around and lots of wind. The kind of rain where the National Weather Service keeps breaking in on the radio to tell you about it and warn of potential hail on the pocket change scale. Fortunately they weren’t comparing it to fruit. Hail on the fruit scale can be pretty scary. As I’ve said before, I like rainy days. I even like the bad storms. There is something awe inspiring about watching the uncontrollable power of an intense storm. I especially like sitting someplace dry like a screen porch and watching the storm rage around me. Yesterday I got to be right out in it. And that’s not so bad when you are dressed for it. Unfortunately I wasn’t. When I went up onto the ship it was sunny and a steamy 95 degrees. Sure there were clouds in the sky. And I’d even heard the NWS break into the radio once as I was heading out to the port. But they were talking about stuff a couple counties away from where I was. And I distinctly heard them say something about very little apparent motion to the storms they were talking about. But then you can’t trust the weather guessers, can you? 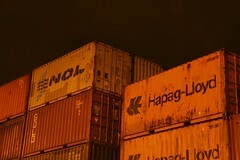 There I was huddling out on deck under a container trying to keep dry without so much as a jacket. I’d make dashes out into the deluge to snap a photo or two and then right back under cover. Then the water started collecting on deck and I found myself standing in a small river. I don’t even mind so much getting wet, especially when I know I can go straight home after the job to get dried off and a change of clothes. The digital camera and the cell phone don’t deal with it so well, however. Funny, that they weren’t even what I was worried about. My paperwork was far from dry. Nothing like a little downpour to make your notes bleed all over each other. During the job was not so bad because I could sort of camp under cover. The real trick was getting back to my car. It was a bit of a hike. And there was no cover. In the end I was pretty soggy. Why is that profound? Well for one thing it doesn’t matter who you are. The weather that’s happening is going to happen to you. It also means that God is no respecter of persons. He is going to give all of us the balance of rain and sun that we are going to get regardless of what we might “deserve”. In the end there is still nothing we can do to control the storm when it decides to rage.